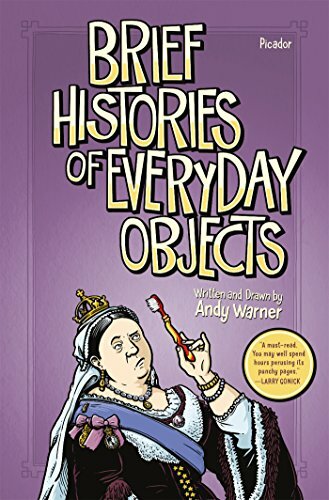 In author/illustrator Andy Warner’s latest graphic novel, Brief Histories of Everyday Objects, just about every major object invented on planet earth is featured in black-and-white comic strips. There is the brief history of jail bird William Addis, who invented the toothbrush by drilling holes in a bone left over from his prison supper and stuffing it with animal hairs; the life and legacy of Sarah Breedlove, aka Madame C. J. Walker and her meteoric rise to financial fame; and how King C. Gillette’s disposable razor made him a very wealthy man. There is the charming history of where flushing toilets came from, where cinnamon came from, and how Post-it notes came about after chemist Spencer Silva invented a glue that didn’t stay stuck. If you’ve ever wondered how bathtubs came about, who invented artificial sweeteners, how shoes were once a luxury item until African American Jan Matzeliger came along, and how Margaret Knight developed flat-bottomed paper bags this book is the one to read. Brief Histories of Everyday Objects is a fascinating look at everyday inventions that people of the Information Age typically take for granted. Each object’s story is categorized the way humans categorize objects in everyday life. The Table of Contents is actually an illustration of a house situated in the city. The house’s bathroom tells the history of toilets, toothbrushes, shampoo, and razors; the kitchen tells the history of Tupperware, coffee filters, and Microwave ovens; and the living room tells the history of gaming items like dice, Monopoly, yo-yos and Slinkies. The Coffee Shop down the street tells the history of tea, artificial sweeteners, and coffee beans; the bar down the street explains beer cans and billiard balls; and the neighborhood grocery discusses paper bags, potato chips, and everyone’s favorite: Instant Ramen noodles. Warner’s prose is down-to-earth and peppered with hilarity. His comic book panels/graphic novel format is the icing on the cake, offering each historical subject in small chunks so that the information is more easily digested. His black-and-white sketches are meticulous in detail and definitely keep readers’ eyes darting back and forth across each page to soak in the great details and humor. Use this graphic novel for independent reading or as a primer for further research into the wide world of innovation. Also great for history, science, and social studies classes—and for historical writers who want to spice up their “future books” list.